Left to right, front row: Charity Wilson, Kanani Jones, and Nysheia Miller. Back row: Quanadra Tunstall, Nijueray Giggetts, and Keslee Hylton. Nysheia Miller was named to the Dogwood District First Team after a great Dogwood District Tournament. 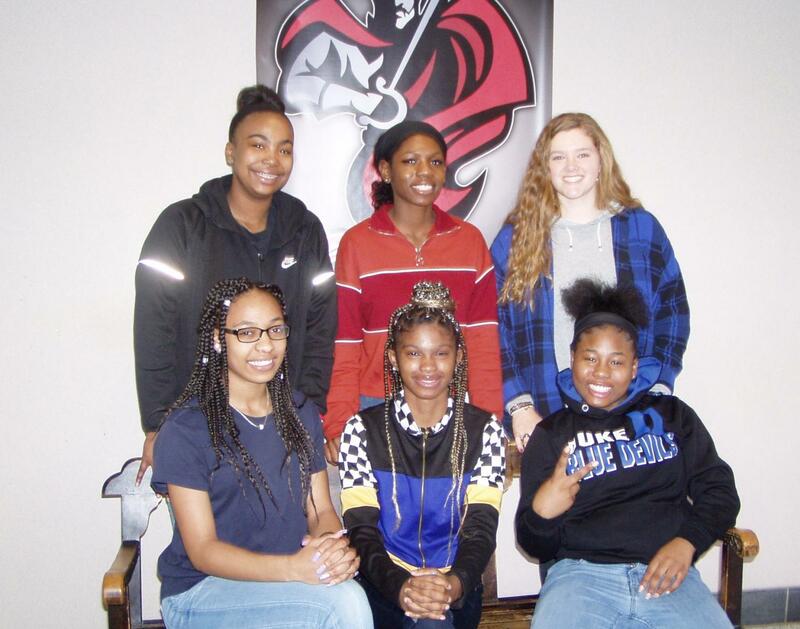 Quanadra Tunstall and Nijueray Giggetts were named to the Dogwood District Second Team. Charity Wilson, Kanani Jones, and Keslee Hylton were all honorable mentions in the Dogwood District Tournament this season. Nysheia Miller was the first ever First Team District Team selection as a freshmen. “I want to continue playing Chatham basketball and eventually play college basketball,” she said. “It feels most exciting to be selected First District Team while being a freshman. I hopefully want to get First Team all my years of playing basketball and play college basketball once I graduate,” she said. Congratulations to our Lady Cavaliers!